Are you a vending company looking for a unique door opener to start the conversation with a prospective client? Then check out the Vend-O-Box from Gas City Vending. 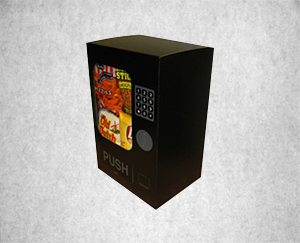 This custom box looks like a miniature vending machine, complete with your company graphics as well as your prospective customer’s name printed on the outside. On the inside is a sampling of the real snacks that you could be providing through your vending program. We have enjoyed nothing but POSITIVE feedback! Everyone who has received one has absolutely LOVED it! In some cases, they’ve requested another! We found that it was the best way to start the conversation, offer samples of the products we carry, get our foot in the door and leave a long lasting impression. When Gas City Vending wanted to expand into an entirely new market, we put Vend-O-Box to work and landed 90% of the accounts we went after! Our original use for the Vend-O-Box as for the Holiday boxes at Christmas for our best clients. It proved to be an excellent way to say “Thank You” for their business and show them some products which may not be in their machines. 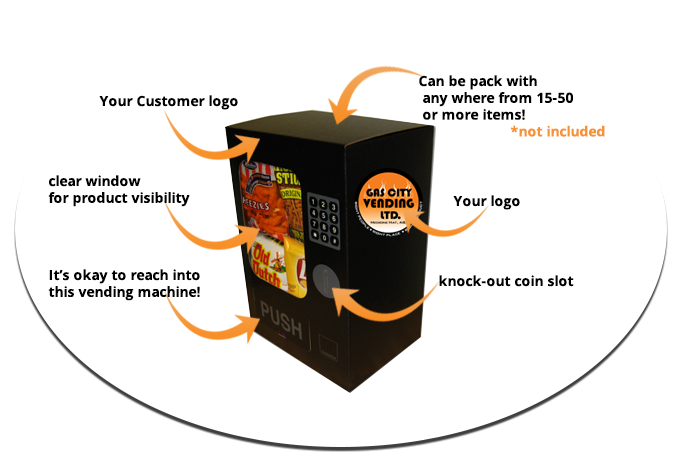 Since then, we have used the Vend-O-Box to build on current customer relationships, as promotional gifts. Door prizes, acquiring new business, birthday parties, fundraising honour boxes, and the list goes on! Kids love the Vend-O-Box too!